Publication week for The Dressmaker! ‘I enjoyed Anna’s story in The Silk Weaver so I was looking forward to immersing myself again in this time period with Charlotte. The prologue at the Foundling Hospital is heart-wrenching. What makes this even more hard hitting is the fact that this scene could well have taken place in reality. Liz Trenow certainly knows how to hook her readers in emotionally! Charlotte is a complex character. Independent and fierce on the outside, she is full of doubts on an inner level. She’s not afraid of confrontation though or of doing the right thing whether that’s for her business or in her private life. I must admit I found her actions with the leeches rather daring, considering what the possible consequences could be. She shows bravery visiting suppliers for payment of overdue bills, outstanding customer service and puts her life on hold when she’s needed by others. Loyal and selfless. You’ll find real historical people woven into The Dressmaker of Draper’s Lane and factual information at the start of each chapter. The information at the start of the chapter details an item of clothing or fabric and what it is – all relevant to the chapter. A fabulous idea and in my opinion, gives deeper understanding for the fashions and foibles of the time. After the story, Liz Trenow has included links to the historical places and people should you wish to find out more. I’ve loved walking through time with Charlotte. If you enjoy historical fiction with secrets and intrigue with women at its core then you should add this one to your reading list. The German soldiers who were loyal and brave. And you have nourished hatred, harsh and blind. The mothers of the men who killed  your son. As we mark the 100th anniversary of the end of the First World War, millions of visitors will flock to the cemeteries and battlefields of Flanders and the Somme. What is little known is that these tours actually began a hundred years ago. In 1919, within weeks of the Armistice, thousands flocked across the Channel on what was then an extremely daunting and risky journey, in a desperate search for news of their lost loved ones. The very first organised trips were run for ‘pilgrims’ by church groups, but companies such as Thomas Cook and Michelin soon realised their commercial potential. Their involvement was highly controversial; furious arguments raged in the letters pages of newspapers about the way in which these ‘sacred places’, where so many died, were being so distastefully ‘desecrated by the spectre of commercial tourism’. Others believed they provided a vital way of remembering and honouring the sacrifice made by that ‘lost generation’, arguing at the same time that visitors brought much-needed income to areas in desperate need of funding to rebuild their shattered lands. I will be talking and showing photographs of the research into early battlefield tourism carried out for my latest novel, In Love and War, (published in the United States as The Lost Soldiers) at the Roman River Festival in my home town of Colchester UK next week (19th September). Click on the link for more details. The talk is free, but booking is advisable. I am proud to announce the publication of In Love and War in the United States and Canada by publishers Bookouture this week. It is available as ebook and paperback via Amazon. 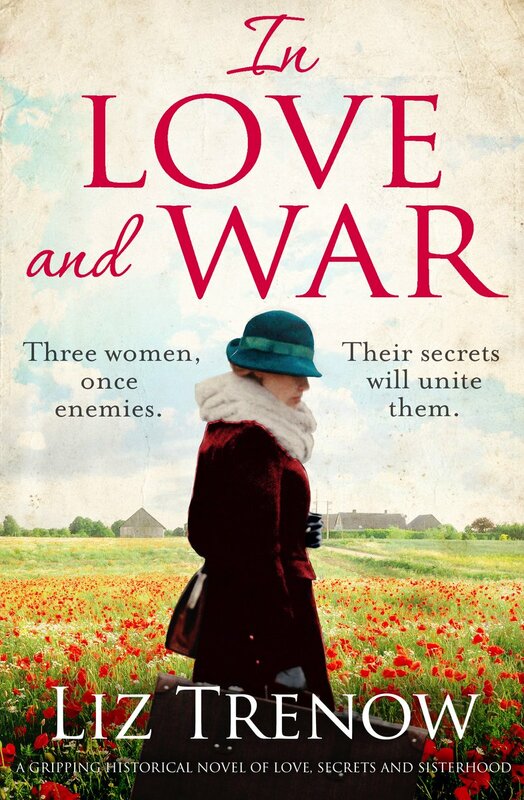 In Love and War is tells the little-known story of the first ever ‘battlefield tourists’, intrepid travellers who visited the devastated areas of Flanders and The Somme almost as soon as the WW1 armistice was signed, almost a hundred years ago. Among my characters is a feisty American woman whose brother who, frustrated with their government’s dithering, bravely joined up to fight with the Canadian forces. Desperate to discover what happened to him she undertakes the harrowing journey to Ypres, little realising how much the journey will change her, too. A new version of Maria’s Quilt! It’s a source of great pleasure to me that even now, four years after my novel The Forgotten Seamstress was published, quilters all over the world are still beavering away making the quilt from the pattern devised by Lynne Edwards, based on my story about a fictional quilter, Maria. This one has come from Mel Terpstra in the US. Thank you, Mel, for your lovely quilt and moving words. You can view more interpretations of Maria’s Quilt here. Two covers for the same book: on the left, the original devised by my UK publishers Pan Macmillan for the book published in January. On the right, the amended version developed by my US publishers Bookouture ready for publication on 12th July. I like them both! Which do you prefer? When I was just starting to research my novel In Love and War, I read to my astonishment that within months of the end of the First World War several thousands of tourists undertook arduous journeys to Flanders and the Somme in a desperate search to find out what had happened to their loved ones. Why was I so astonished? Because these areas were inhospitable: the towns shattered, their roads and railways destroyed, fields and woodland churned up into hundreds of square miles of mud, trenches, shell holes, barbed wire, broken tanks, unexploded ordnance and . . . bodies. A quarter of all those whose died were never found. Some tours were run by church groups but commercial organisations like the travel agency Thomas Cook were quick to respond to the new market, which was extremely controversial because many thought it distasteful to make money from people’s grief. I wanted to write about people who undertook this tour, but I just couldn’t picture it. So imagine my delight when, on a research trip to Ypres, I discovered this postcard. It shows the devastation of the beautiful town square with its medieval cloth hall and the cathedral in ruins. There, in the bottom right hand corner, is a bus with the words Excursions to the Battlefields written in English along its side. Inside, waiting for the tour to begin, it is possible to see a few ladies looking oh so Edwardian in their wide brimmed hats. Suddenly, my novel had come to life.